The General enrolls 100 soldiers to mark the occasion. 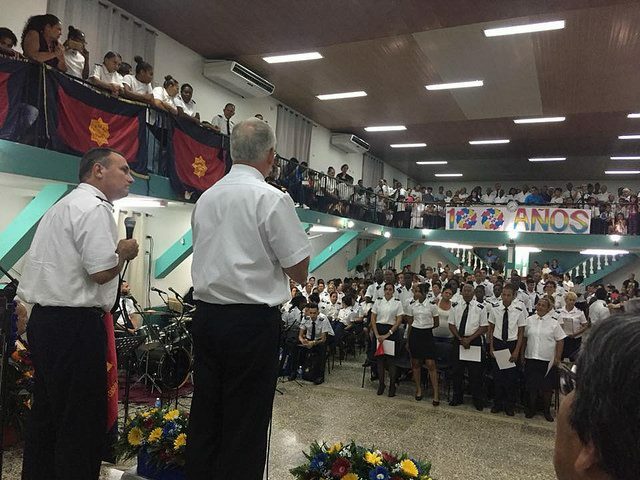 Centenary celebrations for The Salvation Army in Cuba included the enrollment of 100 new soldiers, a testament to the anniversary weekend theme, “How Great is God.” The August gathering of around 1,100 Salvationists and friends in Havana also marked the first overseas engagement for General Brian Peddle, who took office as The Salvation Army’s world leader earlier in the month. The celebrations aimed intended to testify to what God is doing in the here-and-now as well as give thanks for his faithfulness over 100 years of Christian ministry in the Caribbean island. Delegates travelled to the congress venue, the Apostolic Church of Jesus Christ Temple in La Lisa, from every point in the island. The Panama Divisional Brass Band provided musical accompaniment for the meetings. 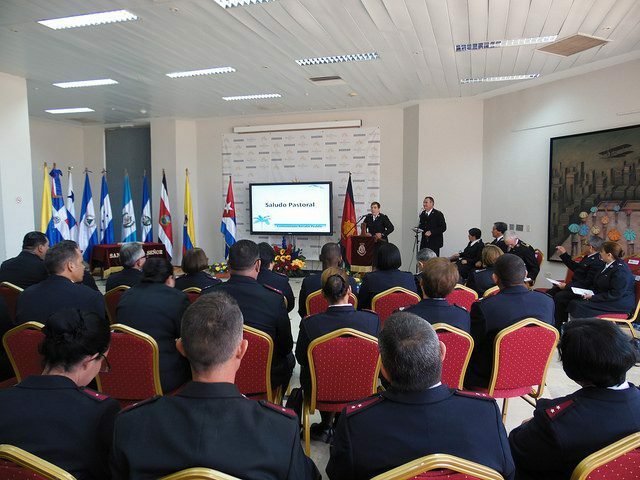 During a spiritual meeting for Cuba’s Salvation Army officers and cadets, The General and Commissioner Rosalie Peddle (World President of Women’s Ministries) exhorted them to be aware of the “urgency of the message of the gospel” in modern-day Cuba and to “walk with God in sincere obedience.” At the meeting’s conclusion, the Latin American News Agency interviewed the General, who expressed joy at being a participant in such an important celebration in Cuba. 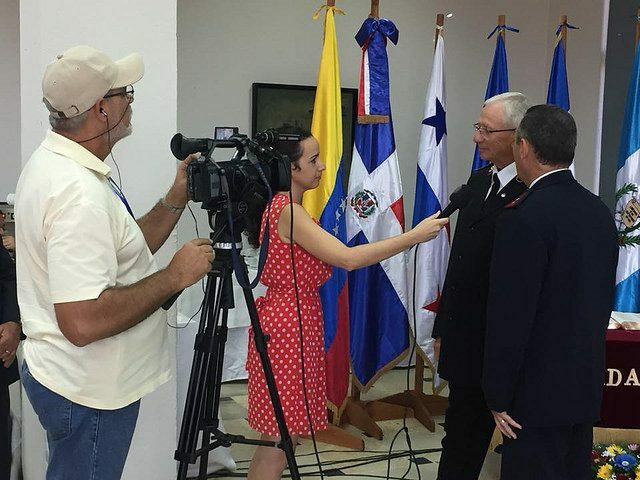 At a public meeting later, the President of the Cuban Council of Churches presented the General with a traditional Cuban hat to acknowledge the faithful work of the Army over 100 years. The strains of a 100-voice choir preceded the mass enrolment of 100 new soldiers from across the country, including four medicine school students from the Democratic Republic of Congo. On Saturday morning a march of witness progressed through Havana’s streets, while the international leaders—accompanied by Latin America North territorial leaders Commissioners Tito and Martha Paredes—attended a meeting chaired by Mrs. Caridad Diego Bello, the Head of the Office for Religious Affairs of the Communist Party’s Central Committee. The meeting with government officials was pleasant and productive, evidence of existing good relations and encouraging for future cooperation. All parties expressed their desire to work together for the purpose of improving living conditions of the Cuban people, both materially and spiritually. Later, local Salvationists presented a sampling of Cuban traditional culture in their continuing worship and thanksgiving. The General and Commissioner Peddle personally greeted comrades and friends and interacted with the crowds. The meeting featured poetry and dance, and included the launch of a new book “The Miracle of The Salvation Army in Cuba,” which records key moments in a century of ministry from early Jamaican pioneers to the present time.